Delphinium 'Blue Bird' has medium blue flowers with contrasting white centers. The showy flowers attract bees, butterflies and hummingbirds. Delphiniums require staking or a sheltered location to prevent wind damage. Deer resistant. 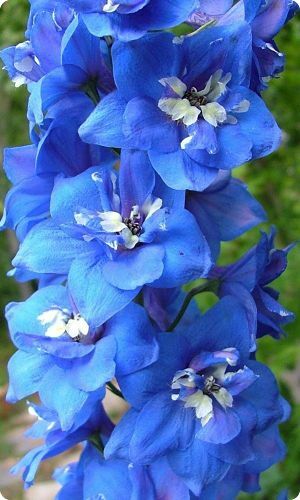 Also known as Delphinium cultorum 'Pacific Giant Blue Bird'. Delphinium is a perennial flower that blooms in early to midsummer with tall spikes of blue, purple, white or pink flowers. Hardy in zones 3-9. Start delphinium seeds indoors 8 weeks before the last frost date. Sow 1/8" deep. Full sun to part shade. Fertile, well-drained soil. Spacing 24". Delphinium 'King Arthur' has tall spikes of royal purple flowers with white bees. The deep color is stunning in the garden. King Arthur delphium makes a great companion plant for roses. The finely cut foliage is attractive. 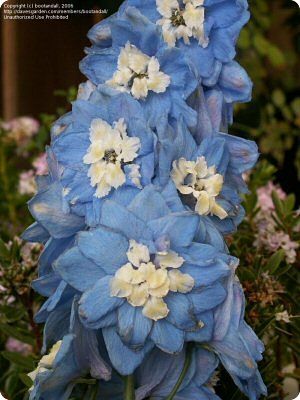 Also known as Delphinium 'Pacific Giant King Arthur'. Delphinium 'Summer Skies' is an elegant variety with light blue flowers that have white bees. It combines well with other flowers in the garden, including other delphiniums. Also known as Delphinium 'Pacific Giant Summer Skies'. Delphinium 'Astolat' has soft lilac-pink flowers with white centers. The long-stemmed flowers are excellent for cutting. Also known as Delphinium cultorum 'Astolat' from the Round Table Series. Delphinium 'Black Knight' has dark purple flowers with black bees. It's a tall variety for the back of the border or the center of an island bed. It looks lovely in the cottage garden. Also known as Delphinium 'Pacific Giant Black Knight'.